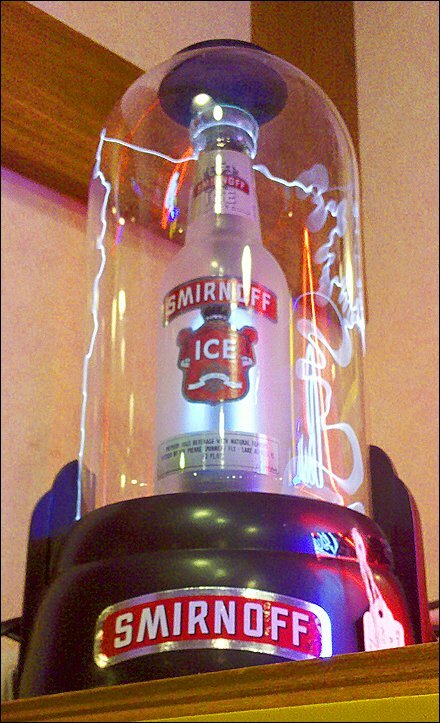 Bolts of lighting skit and skitter around this Smirnoff POP Display Design By Van de Graaff as salable memorabilia. Here the item serves as its own point-of-purchase display. I could not tell from a distance if it is a Van de Graaff Generator or Cold Fusion power. Nor could I check the price tag barely visible lower right. However just the gift for my twentysomething-ish son’s birthday. How did I manage to capture this POP Display Design By Van de Graaff with zoom, under poor lighting with a handheld, non-F-stopped, smartphone camera? God must drink Smirnoff.